A point of sale system Malaysia is a key part of a successful business. Having an easy to use POS software Malaysia will help you and your employees work more effectively, which will help limit the number of mistakes that are made. The Sage UBS POS system Malaysia is one of the best systems on the market since it can be used as a store or restaurant POS system. The Sage UBS POS system Malaysia is simple to set up and use. The system is designed to work with most plug and play barcode printers and scanners. You can also use touch screen devices to enter sale information. Within just a few finger presses, you can complete a sale transaction. This makes it a great option for both restaurants and retailers. Sage is one of the first POS systems that are integrated to use Electronic Credit Card Terminals or ECCTs. This allows sale transactions that involve debit or credits cards to be completed fairly quickly, which saves time while reducing input errors. The software also makes it easy to monitor your sales and your financial returns. This allows you to dedicate more time to improve your customer service and increase your sales. Along with being a very efficient POS system Malaysia, the Sage UBS Point of Sales System can be easily integrated into Sage’s UBS Accounting and UBS Inventory and Billing software. This means that it can offer better insights about your business because the information that the software gathers can help you make better decisions about your business in the future. 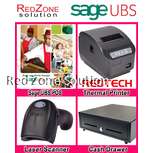 RedZone does not only stock the Sage POS Software Malaysia, we also stock the items that you need to run the software. There is no need to order from multiple websites and wait for different orders to be shipped. RedZone offers all of software and equipment that a successful business may need, at reasonable prices. The POS software Malaysia is simple to install, and you can use most models of UBS scanners with the Sage software. This means that you can have your own POS system setup within a few hours. No matter if you are looking for retail or a restaurant POS system. Having a POS system is an important part of a business. The Sage POS software is designed with businesses in mind, which is why it provides so much useful information about your business.